Configure those General Settings in your Reply profile to access your account data, billing options, email accounts, scheduling, API & more. The Account tab lets you change your Full name, Company, Phone fields and change your password. You can also upload a profile picture visible to your team members. On this tab, you can upgrade/downgrade your plan and verify how many unique contacts you have already contacted according to your subscription limits. You can also pay for Calls here. Specify a custom delay before sending the initial email, once you have added a contact to the active campaign. It's set to 30 seconds by default. The total number of emails that could be sent by the user per day is a compound number of all automated emails (first-step and follow-ups) that could be sent from your Reply account per day. If the limit is reached, you will see a warning on the Campaigns page. Set the maximum number of emails that can be sent to a single contact per day. Email notifications allow you to subscribe for the daily/weekly/monthly reports, which Reply will send to the specified email address, letting you know how many email have been sent from your Reply account in the specified time interval. In the Timezone section you need to specify the timezone you're in, it's not picked up automatically. The Email Accounts tab lets you manage your emails accounts connected to Reply. To add an account, click the Add button at the top right corner of the screen. For more information, see the Step #1: Connecting an Email Account article. 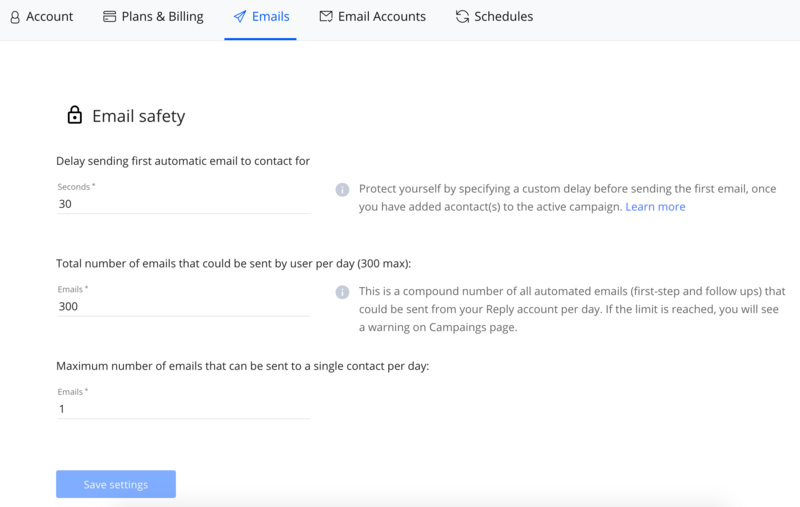 The tab lets you see your daily limit for emails sent (based on your current plan) and the overall number of emails sent from each connected email account. The Schedules tab lets you create and manage schedules for sending emails within your campaigns. For more information, see the Delivery Windows (Schedules) article. The API Key tab contains the API key for your Reply account. You need this key in order to access the Reply API. For more information about the API, see the API and API 2.0 sections of the documentation.